One of our other adventures during my Hawaii vacation earlier this year was a hike along the epic Na Pali Coast of Kauai. For an entire day I hiked the Kalalu Trail directly along the coast of Hawaii's "Garden Island" and it was definitely the most amazing trail I hiked so far. Naturally, this activity deserves its own post on here! The rugged coast line offers amazing views so be sure not to miss it once you make it to the Island State! 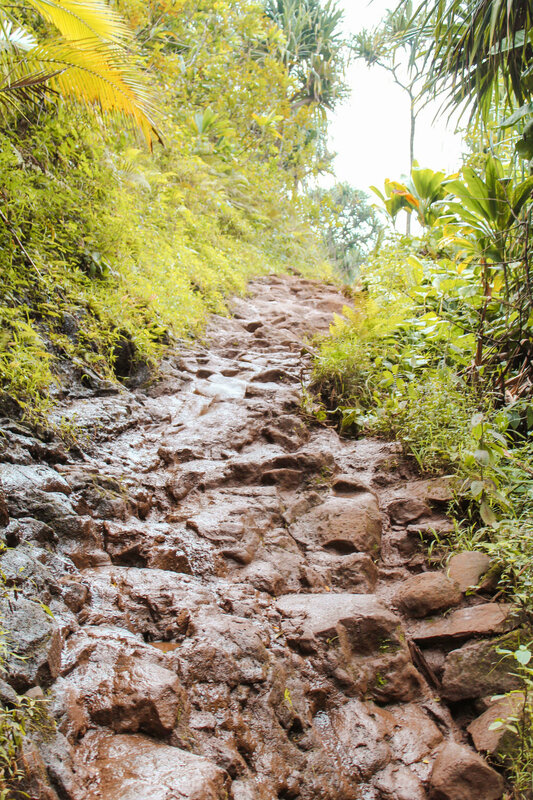 The Kalalu Trail is in the North of the island Kauai and offers different hiking options. One is a 11 miles day hike which crosses over five valleys. Of course you can also do a shorter version. A good option is the 2 mile hike from from Ke'e Beach to Hanakapiai Beach. Add another 2 miles and you reach the waterfalls Hanakapi'ai Falls, which is also a great destination for a shorter hike. To hike further than the falls you will need a permission, so be sure to decide in advance if you wanna do the long hike or a shorter version. Whatever you decide on - the trail is amazing from the first steps and offers the most amazing views, so you can't go wrong with any option. Even if you decide to only hike a short part, you should be prepared and bring enough food and water. The hike will take longer than you think as there are some difficult sections along the way and the air is very humid. The Kalalu Trail was repeatedly named one of the worlds's most dangerous hikes (e.g. from Outside Magazine) but it's probably one of the most beautiful ones too. So it's definitely worth it. Hiking the trail is the best option to explore the magnificent Na Pali Coast. If you don't want to hike, you can explore the area by helicopter and boat as well. Even though these options might offer spectacular views, I would still prefer the hiking option. The helicopter flights are said to have a bad impact on the nature due to their noise. Their sound is also very annoying for hikers, too. And in my opinion you can enjoy this amazing nature best up close. The Kalalu Trail is the only land access to this part of the island, which is a masterpiece of physical geography and definitely worth exploring. As I started the hike quite late, I only had time to hike the first part to Hanakapiai Beach. I would have loved to go further, but we simply would have needed much more time - also because for me hiking in this kind of climate was very new and unusual so it took me a while to get used to the temperature and humidity. I am still very glad that I got to see the first part of the trail, which was already incredibly amazing. One of my favorite parts of the hike was crossing the Hanakapiai stream right before the beach area. Hanakapiai Beach is the perfect spot to take a break. The beach itself seems to be quite dangerous though, as the waves are huge and water happens to flood the entire area occasionally - so don't take a swim! Unseen currents have already killed more than 83 visitors. I already mentioned that I started hike quite late, so I was not able to make it past the beach to see the waterfalls. But this is just one more reason to come back to this amazing place! I feel very lucky to have been able to enjoy this stunning part of our planet in my lifetime so hopefully this post will inspire some travellers to make this trek. The Kalalu Trail is located on the northern part of Kauai, which is approximately a one hour drive from Lihue airport. It's really easy to find as it is literally at the end of the highway. As it is a popular destination, you might want to consider arriving as early as possible. Definitely plan enough time for the hike as 2 miles might not sound too far, but you will most likely need longer than you think. Did you know about this amazing trail? And would you consider hiking it? Or have you done so already? It should definitely be on your Bucket List! Kate recommends: A Na Pali Coast hike goes very well with a copy of David Mitchell's "Cloud Atlas". Enjoy a literal journey to different islands in the South Pacific and through time along with the incredible views of Kauai's coast. In his book, the author tells six different stories spanning a time frame from the 1800s to a post-apocalyptic, futuristic Hawaii. Why not include some fantasy into your island escape?